All directions on this page are copyright to Beth M. I am only hosting them for her. While most people are looking for a Mei Tai in a pretty floral or even funky fabric, a friend wanted a simple, plain MT that either she or her husband could wear. I jokingly dubbed this particular carrier ' the Man-Tai' because the fabric is far more masculine than the 'pretty' MTs I typically like to make. I've written out step-by-step instructions below explaining how the 'Man-Tai' was made. Please feel free to use all or part of these instructions to make your own carrier for PERSONAL use -- I have tried in various places to explain how you can use your own measurements to make a MT that is a good fit for you and your baby. Permission is NOT granted to use these instructions to make a carrier for retail/wholesale. 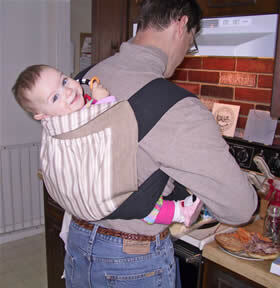 And, maybe my friend is on to something -- if we were to make more 'masculine' carriers for our husbands, they might be more apt to be bitten by the Babywearing bug, too! It assures your carrier will not shrink after it is completed ( the black strap fabric in this project shrunk 4" in length after being washed!). 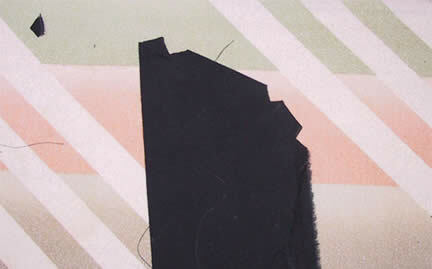 the fastest way to 'cut' your strap fabric is to rip it -- this assures that the straps are straight ( the fabric rips along the weave) and it is SO much faster than cutting them. 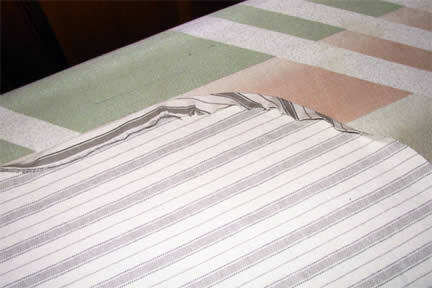 First, TEST YOUR FABRIC to make sure it can be ripped without damaging the fabric. 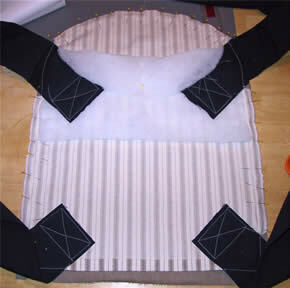 If it can not, then I encourage you to invest in a rotary cutter and cutting mat -- it will make cutting straps easier. If your fabric DOES rip easily, make a small 1" cut in the fabric just above the selvage edge, and rip the selvage off (I've found that the selvage shrinks differently from the rest of the fabric, making it tough to lay flat). 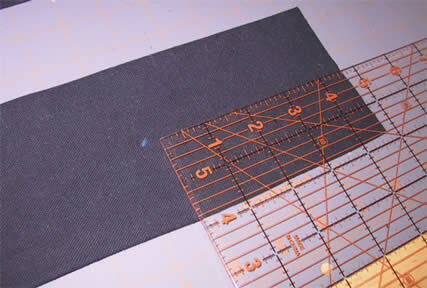 Then, measure how wide you want your fabric to be (see below) and make a small 1" snip, then let'er rip! Length: Decide how long you would like your top straps to be, then add 6" (which will be sewn inside the body of the carrier). Usually, 60" long straps fit 'most', and 75" long straps fit most 'fluffy' people (size 20 and above). The bottom straps only need to be long enough to be tied around the waist -- some people prefer a bow to a knot, so take that into account when deciding on your bottom strap length, then add 5" (which, again, will be sewn inside the carrier body). 30" is more than enough for most people. Usually, the bottom straps are about 1/2 the length of the top straps, which means you can rip three lengths of fabric, then cut one in half to make the bottom straps. Width: When sewn, the straps will be folded in half lengthwise and stitched on one end, and then down the side, so the cut width of your straps will be double the finished width, plus double the seam allowance . Straps can vary in width from 3-4" (if you have narrow shoulders, you may prefer narrower straps, and if you are broader, you may prefer closer to 4"). 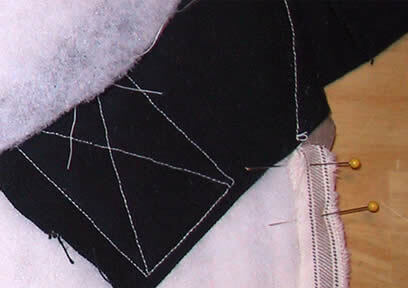 Whatever width you decide is right for you, add your seam allowance (I like to use 1/2" since it keeps the math simple), then double that number to get your cutting width. Tapered Ends (optional): If you like tapered ends on your straps, fold your straps in half lengthwise, then use your quilting ruler to make a 60 degree cut at one end of your straps. 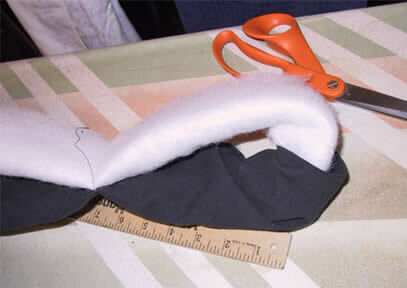 Be sure to cut so that the longest part of your strap is along the fold, or it will be bulky when turned right side out. * What size is your baby? * Do they like to have their arms in or out? 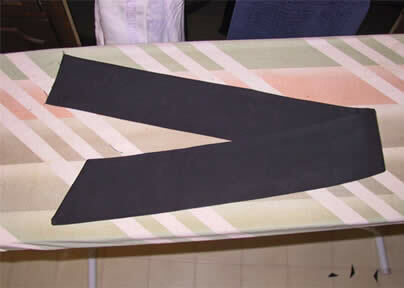 Bodies which are too long easily can be folded at the waist to be shortened until the baby grows. However, bodies that are too wide may be uncomfortable for a baby (however, newborn legs can be fully tucked up inside the MT body in a 'frog-legged' position for a snuggly nest). You want your baby's legs to be able to bend at the knees comfortably when they are seated inside the carrier. To determine the right size for your baby, hold your baby in front of you, as they would be when seated in the MT, and use a tape measure to measure from just behind one knee, around the back of the bum, to just behind the other knee to determine the width. For the height, put the tape measure under your baby's bum so it touches your belly, then bring it up around the baby's bum, up the back, to the height you'd like the carrier to be. 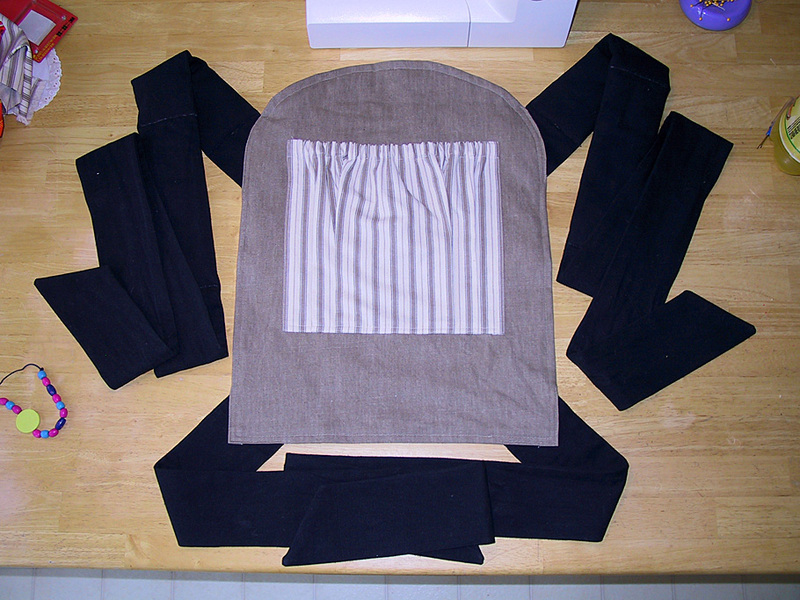 Then add approximately 3" ( the amount of the body that will be tucked up against you when the MT is apron-tied) -- this will be the height that works best for you and your baby. If you would like to have a curved headrest, cut a curve that is about 4-5" in height. For this project, I only put padding in the shoulder straps, but some people like to put padding in the bottom straps as well, as it can help keep the straps from cutting into the sides of a 'well-padded' wearer. 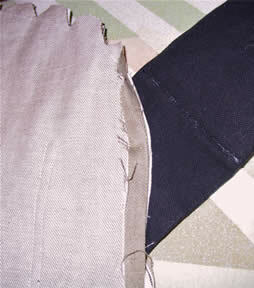 I have found that canvas, being thicker and slightly stiffer than other bottom weight fabrics (such as twill), is less likely to cut into people at the waist, so I do not pad waist straps made of canvas, but I do when using twill. Cut two pieces of batting that are 1.5" narrower than the width of your straps ( the batting in the photo to the right was cut a little too wide and had to be trimmed later). the length of the padding depends on your preference. When wearing my baby on my front, I prefer my padding to extend below the crossed straps on my back by a few inches, as it gives extra padding and helps keep the straps spread wide. Others may prefer padding over the shoulder area only. Again, use a tape measure to measure yourself and see how long you would like your padding to be. 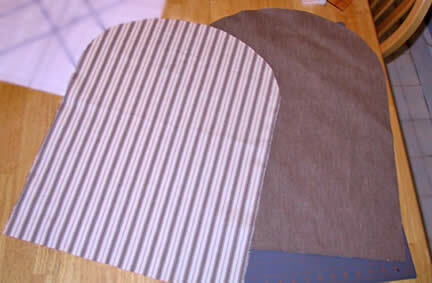 Fold the batting in half so that the fold is in the center of the fabric. 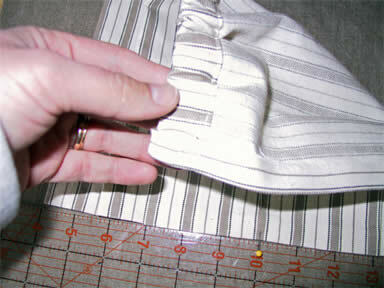 Place it 6 1/2" from the end of the strap, and 3/4" from the seam edge. Pin it in place on both ends and in the middle. Machine sew the batting to the strap in three places: at each end and in the center. 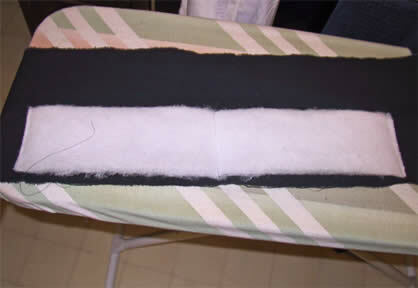 Next, fold the strap fabric in half lengthwise, right sides together and pin. Sew the tapered end and the long seam, leaving the end that will attach to the carrier open for turning. Notch the corners at the end of the straps so they will turn neatly. Turn the strap right side out. Use a yard stick and begin at the tip of the strap, pushing the tip inside itself. Ease the area where the batting is attached carefully. Once the strap is turned completely, use the yard stick to make sure that the batting is spread out flat inside the strap. After turning, press the length of the strap with an iron (be careful not to iron the batting very much, or it will melt/compress -- learned that the hard way!). Next, stitch across the width of the straps along the ends of the batting again (going over the original stitching), so that the batting is securely fastened to both sides of the strap. At this point, some may prefer to topstich around the edges of the straps. 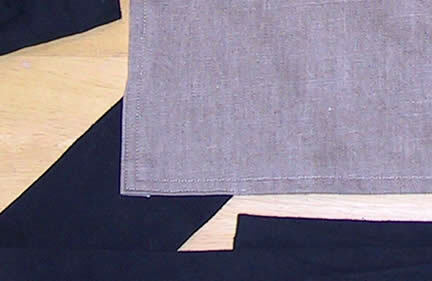 With canvas, as a good ironing seems to be enough for the straps to hold their shape, but a less stiff fabric like twill might benefit from topstitching. Repeat for all four straps. A pocket can be a nice feature to have on a MT; some people like to have them so they can slip in a cell phone, wallet, or even an extra diaper, but others feel they ruin the 'lines' of the MT. On my first MT, I used a BMT-style pocket (which has openings on the side ra ther than on the top), but found that I was not as dexterous as Beth, and couldn't reach it when wearing my daughter on my back. Also, being sewn on the top and the bottom, the pocket didn't expand as much as I needed, so I went back to a simple design with pleats along the bottom (so the pocket can expand) and elastic at the top. 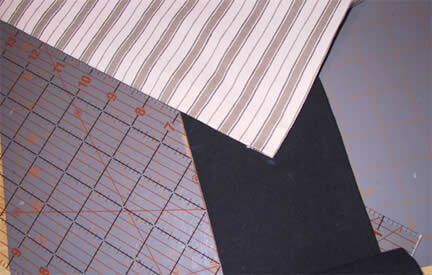 First, cut a piece of fabric about 1 1/2" taller than you want the finished pocket to be. 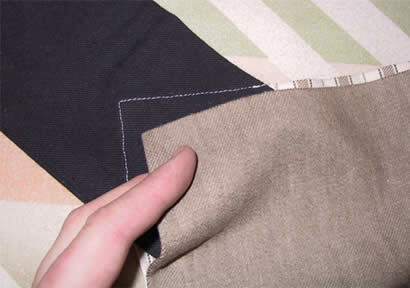 The width of the fabric depends on how large AND how 'puffy' you would like your pocket to be. 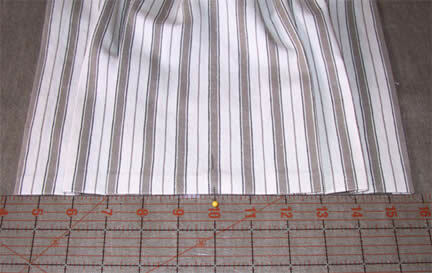 The wider you cut, the deeper your pleats will need to be, and the more your pocket will puff out. 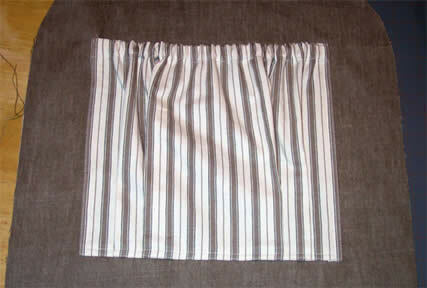 If you are unsure at this point, follow the pleating directions from the BMT instructions. 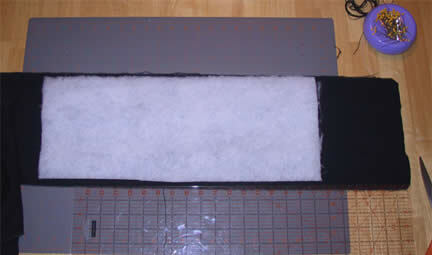 Make a casing for the elastic: along the top edge, turn under 1/4" and press, then turn under 3/4" (for 5/8" elastic) and press. 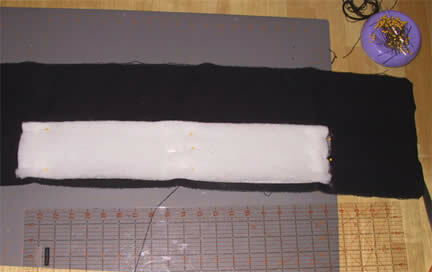 Sew along the edge, creating the casing through which the elastic will run (note: in photo, casing is at the bottom!). On the other three sides, turn under 1/2" and press (hint: press the bottom first, then press the sides -- this hides the edges best). To be honest, I totally winged the placement of the pleats -- I wanted the stripes to match up at the bottom so they were almost invisible, so the lines of the fabric were my guide. I made the first pleat about 3" off center, then the next (smaller) one about 1 1/4" away from that one (centered between the first pleat and the edge). As I went, I pressed the pleats. Pocket placement: Center the pocked horizontally (from right to left) on the body of your MT, but remember that the lower part of the MT will be under your child's bottom, so you should place the pocket closer to the top of the MT (but not so high that it will interfere with folding down the arch). After pressing the pleats, I knew exactly how wide my finished pocket would be, so I knew how long the elastic needed to be at the top. I cut the elastic to the correct length, then threaded it through the casing, using a zig-zag stitch to firmly attach it at both ends of the casing. After pinning down all three sides, I did two rows of topstitching around the edges of the pocket (like the back pockets on your favorite pair of jeans, LOL), one as close to the edge as possible, and the other about 5/8" in from the edge. 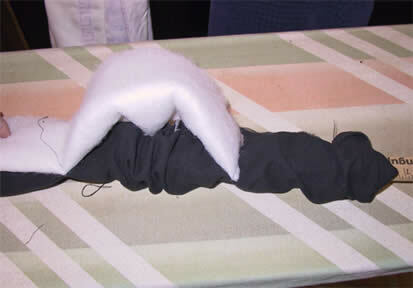 Overview: One of the most difficult parts of making a MT is to attach the straps so that they are a) at the same angle and b) finished off neatly where they meet the body. In this MT, the straps are attached to the back panel of the MT, then the front and the back are sewn together, leaving 4 holes where the straps are then pulled through and finished off. Hopefully these instructions, though long, will help take away some frustration and leave you with nicely finished MTs. First, press under 3/4" at the bottom of the back body panel. Next, press under 5/8" on each side of the lower part of the MT body, about 4-5" from the bottom. On the two bottom straps, put a dot in the middle of the strap using a fabric pencil, 5" in from the end. 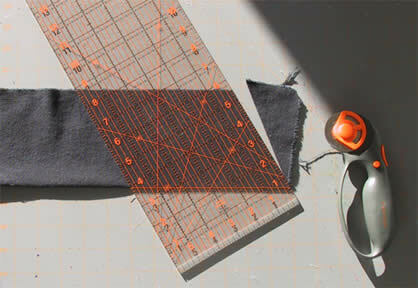 Put the dot at the corner that you just pressed at the bottom of the MT, then use your quilting ruler to set the strap at a 45 degree angle to the bottom edge (in the photo, the left edge of the strap is along the 45 degree line of the ruler). Pin both straps in place, then topstich along the very edge of the MT body, ONLY where the strap meets the body (hint: start your stitching about 1/8" onto the strap, and stop 1/8" before the strap ends (ie, don't go off the edges of the straps). This will make things easier later on -- trust me! Angle: Preferences vary greatly on the angle people use to attach their straps at the top of the carrier. You will see everything from completely horizontal (like a My Bei Bei) to nearly vertical. Some find that attaching the top straps closer to a 60 degree angle will snug the baby in more tightly, while attaching the straps at closer to a 45 degree angle gives the baby a little more wiggle room. Placement: Part of where you attach your straps will depend on how wide your MT is -- some people find placing the straps on the straight edge of the sides is better for smaller bodied MTs, while wider-bodied MTs work better with the straps placed slightly on the curve. I created a pattern on paper and drew the strap attachment location on it, as well as the strap angle, to help me with placement when pinning the straps on. Next, use your quilting ruler to measure down from the top of the arch to make sure the straps are attached at the same spot on both sides, placing the strap so the padding starts about 1/2" from the carrier body. Then, pin the shoulder straps in place, and topstitch along the edge, just as was done at the bottom. Note: while it's not a big deal for the angle to be off by a few degrees in your strap placement, it IS important that your straps match each other, or your baby will lean to one side and be uncomfortable. One way to make sure the angles match exactly is to attach one strap, then fold the carrier in half along the midline, then attach the second strap, using the first one as a guide. Cut a piece of batting to fit the top 1/2 of the body panel -- you can cut it a little large around the arch at this point -- you can trim it to size later. Place the batting UNDER straps before stitching the X-box reinforcement at the end of both straps (this helps to hold the batting in place). Pin back to front, RIGHT SIDES together (very important!). The batting has been pinned out of the way temporarily for sewing. Alternate method: In more recent MTs, I've found it is easier to go ahead and pin the padding along the top of the arch and sew it into the seam, but be sure to trim away the extra padding as close to the stitching as possible (so it won't be lumpy). 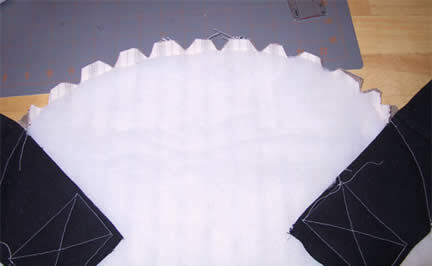 This way, you won't have to worry whe ther your padding has been secured in the stopstitching fur ther along. You can do the same along the side seams below the straps. As you pin the two body pieces together, try to pin as close as possible to the straps, without actually catching the straps. 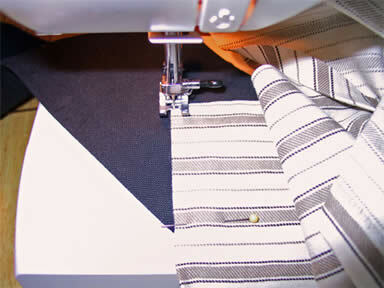 Making a very small snip in the body fabric close to the straps helps make pinning easier. But, BE CAREFUL not to snip too close to the stitching!! Stitch around the outside of the carrier, right up to within 1/4" of the straps, leaving the bottom completely open at this point. 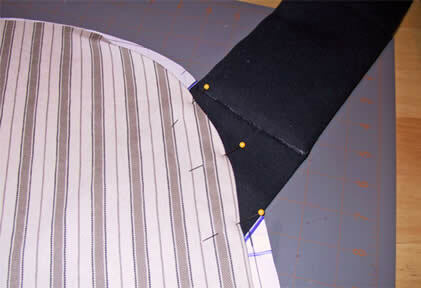 After stitching, go back to the top of the carrier and notch the fabric on the top seam so it will turn more neatly. 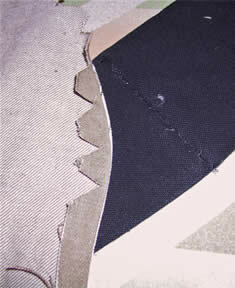 Also, at this time, trim the batting as close as possible to the line of stitching along the arch. BEFORE you turn the carrier right-side out, there is a little work that you can do which will make finishing so much easier. 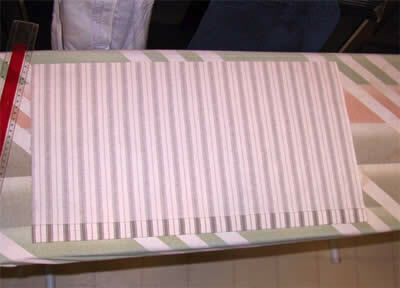 Heat up your iron, then turn up the bottom edge of the front, aligning it to match the bottom edge of the back, then press. Do the same for the side seam (just where the strap meets the body). This makes lining up the two sides much easier. 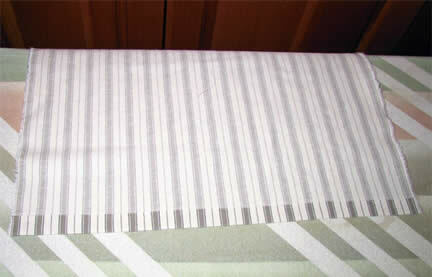 Fold the front fabric along the edge of the top straps so that it matches the material underneath, and press it back (in the photo to the right, the white striped fabric from the back can be seen just barely peaking out from underneath). 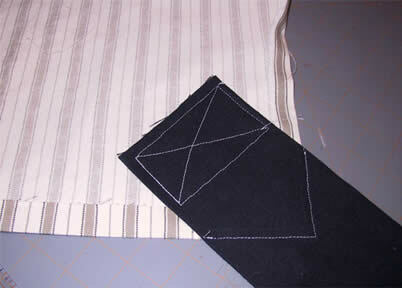 Notching the fabric along the curve helps it to lay flat -- just be careful not to snip too close to the edge. Un-pin the batting and turn the carrier right-side out through the bottom, pulling the straps through the four holes. 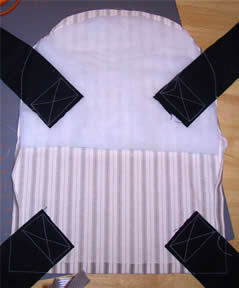 Press the outside edges of the carrier (be careful not to press the batting too much). Then reach inside from the bottom and smooth out the batting so that it lays nice and flat, and snugged up to the seam at the top of the arch. 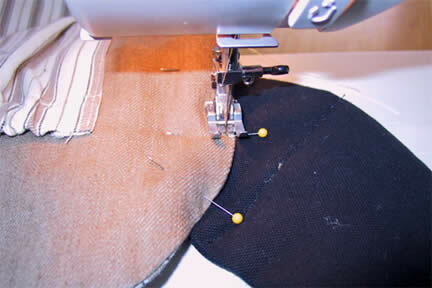 You will see that, in addition to having your strap gap seams already neatly pressed, there is also a line of stiching to guide you where to pin the body to the strap. No guesswork involved! Just pin the body to the straps, overlapping the guide stitching slightly. Topstich along the very edge of the body where it meets the straps. 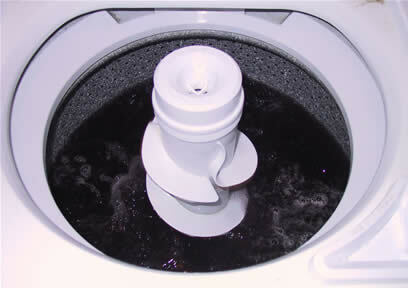 If the front fabric and back fabric are two very different colors as these are, thread the top of the machine with thread which is the color of the top piece you're working on, and thread the bobbin with thread that matches the color of the bottom piece -- your seam will almost disappear on BOTH sides. After you have smoo thed the batting down inside the carrier and made sure it is laying flat against the seam of the arch, pin the bottom of the MT body closed. Finally, topstich around the entire carrier, about 5/8" in from the edge. This will close up the bottom hole. 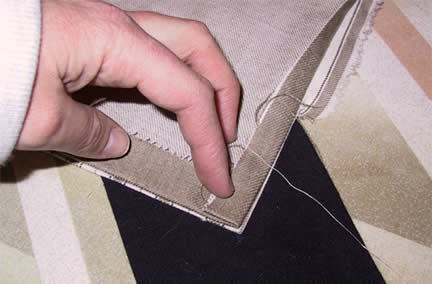 Be sure that you are able to catch the folded edge in your stitching. 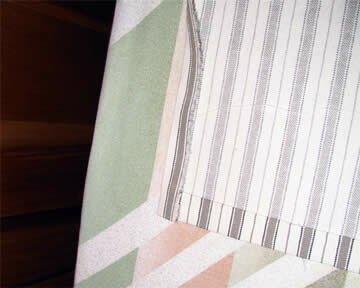 You also want to be sure that you catch the batting in your topstitching along the top arch. And Voila -- You have the 'Man-Tai'!